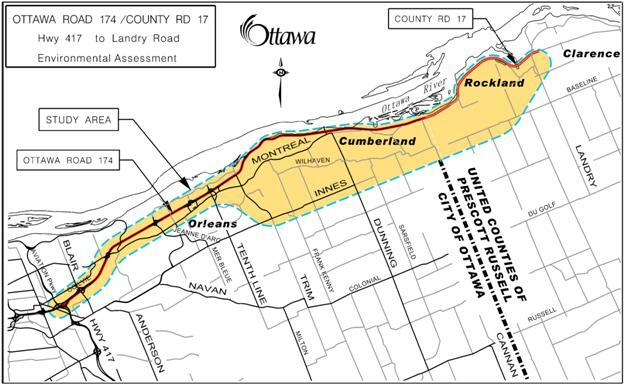 That the Transportation Committee approve the Statement of Work submitted by the United Counties of Prescott and Russell for the Ottawa Road 174/County Road 17 (Highway 417/Split to Rockland) Environmental Assessment Study as detailed in Document 1. Que le Comité des transports approuve l'énoncé des travaux soumis par les Comtés unis de Prescott et Russell pour l'étude d'évaluation environnementale de la route 174 d'Ottawa/route de comté 17 (de l'embranchement de l'autoroute 417 à Rockland), comme le précise le document 1. BE IT FURTHER RESOLVED that the results of the Environmental Study for the widening of the OR 174 from Jeanne D’Arc Boulevard easterly be considered and incorporated into the City’s updated Transportation Master Plan. This report is in response to this motion and accordingly, the United Counties of Prescott and Russell (the “County”), in partnership with the City of Ottawa (the “City”), is bringing forward the Statement of Work for this Environmental Assessment (EA) Study. 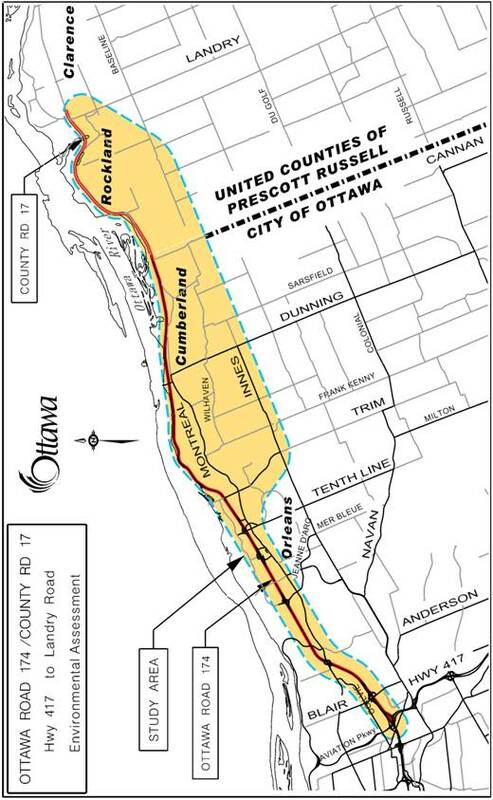 The United Counties of Prescott and Russell in partnership with the City of Ottawa are undertaking a multi-jurisdictional Class Environmental Assessment (EA) Schedule C Study for improvements to Ottawa Road 174 from the Highway 417/Ottawa Road 174 Interchange (the “Split”) to Canaan Road in the City of Ottawa, and improvements to Prescott Russell County Road 17 from Canaan Road to County Road 8 (Landry Road) in the United Counties of Prescott and Russell. The United Counties of Prescott and Russell will be the lead proponent as defined in the Class EA. This Statement of Work describes the intentions of Prescott and Russell (the “County”) and the City of Ottawa (the “City”) with respect to the methodology, public consultation and deliverables for this study. Ottawa Road 174 and County Road 17 from east of the Highway 417 Split to east of Rockland was formerly Provincial Highway 17 and was transferred to the City and the County in the 1990s. In the City, the section from the Split to Tenth Line is a four-lane freeway with interchanges and full access control. Dedicated transit lanes in both directions of and within the Ottawa Road 174 road corridor extend eastwards from the Transitway east of Blair Station ending at Place D’Orleans station. East of Tenth Line, the road transitions to a four-lane arterial with a signalized intersection at Trim Road, and then continues as a two-lane undivided arterial to the east, passing through residential homes on both sides of Ottawa Road 174 with direct access to the roadway. From the City limit at Canaan Road easterly to east of Rockland, the road is under the jurisdiction of the County. Owing to the natural geographic constraints of the Ottawa River and the Mer Bleue Bog, there are limited alternative east-west transportation routes in the east urban area to service transportation demand associated with existing and planned development in the City and the County. Alternative roads such as Old Montreal Road and Innes Road are not continuous through the study area from Ottawa to Rockland, and the Rockliffe Parkway is not designed as a high capacity arterial. Extensive growth in Orleans, Cumberland and Rockland has increased traffic volumes on Ottawa Road 174/County Road 17 leading to congestion during peak periods. In addition, there are road safety concerns related to the numerous at-grade intersections, lower geometric design standards of the two-lane roadway as well as high traffic demand and the lack of passing opportunities, resulting in a poor level of service. Capacity, operational, and safety improvements may be required to address these deficiencies. The proposed study limits are shown in Figure 1. Widening of the Ottawa Road 174 from the Split to Jeanne D’Arc Boulevard is identified in the City’s Transportation Master Plan (TMP) as a Phase 2 project (2016-2022) with no plans for expansion beyond Jeanne D’Arc Boulevard eastwards within the City’s current planning horizon. This is consistent with the City’s Official Plan (OP) and TMP planning objectives of intensification, giving priority to public transit to increase transit modal split, and integrating transportation and land use. Furthermore, the City has a goal of achieving a future 41% transit modal split at the Green’s Creek screenline, which will require consideration of complementary transit objectives in this study such as the East Transitway extension from Place D’Orleans to Trim Road, identified in the City’s TMP. For this joint EA study, transit supportive initiatives will also be considered beyond the City limits and will include transit and carpooling in the County as part of the scope of work. The City of Clarence-Rockland has identified in a previous transportation planning study a southern corridor around the Rockland urban area. This corridor is being protected in the City of Clarence-Rockland’s Official Plan. The EA Study Area includes the consideration of either the northern County Road 17 alignment or the southern corridor within the City of Clarence‑Rockland extending east and terminating in the vicinity of Landry Road connecting to County Road 17. · Effects on existing communities (Ottawa, Cumberland and Rockland). Project Cost Estimate Report identifying the project baseline budget in Work Breakdown Structure (WBS) format divided in logical divisions including the geographic limits of the City of Ottawa and County. The study will examine and evaluate the project’s effects on social, cultural, physical, and natural environments within the study area. Appropriate mitigation measures will be developed and post mitigation environmental impacts will also be determined. The study area lies within the urban and rural areas of the City and County. Potential impacts on the rural character, rural residents, and any active farming operations will be incorporated in the study. Traffic demand originating from existing and future residents of the rural areas in both the City and the County will also be incorporated into the study process. Consultation with stakeholders, public agents, and individuals will be an integral component of the EA study. The consultation process will include meetings with key stakeholders through the Agency Consultation Group, Public Consultation Group, and Business Consultation Group. Consultation with the general public will occur principally through open houses and also through the project web page, e-mail, and additional meetings as required. Councillor Tierney has read the Ottawa Road 174/County Road 17 (Highway 417/Split to Rockland) Environmental Assessment – Statement of Work and is in agreement with the content as presented. Councillor Bloess agrees with the report. Councillor Monette has no concerns with this report. Councillor Blais comments: Hwy 174 is a vitally important link for residents of Orléans and Cumberland. Movement on this file, which I wholeheartedly support, after decades of inaction is very good news for residents who want to spend more time with their families and less time in traffic and I look forward to the results. There are no legal impediments to implementing the recommendation in this report. For this EA study, any accessibility requirements will conform to the Accessibility for Ontarians with Disabilities Act. Consistent with a legal agreement between the County and Province, as well as with the direction of Ottawa City Council, this EA study is to be funded through the Province. Following Committee approval of the attached Statement of Work, the County, in partnership with the City of Ottawa, will commence with a competitive procurement process in the selection of a consultant. Furthermore, the City’s Legal Services will prepare a legal agreement with respect to the EA study between the City and the County. The City of Clarence-Rockland has identified in a previous transportation planning study a southern corridor around the Rockland urban area. This corridor is being protected in the City of Clarence-Rockland’s Official Plan. The EA Study Area includes the consideration of either the northern County Road 17 alignment or the southern corridor within the City of Clarence-Rockland extending east and terminating in the vicinity of Landry Road connecting to CR17. The study will be consistent with the approach and requirements set out in the Provincial Environmental Assessment Act. An initial meeting with the Ministry of Environment (MOE) has confirmed the validity of the Municipal Class EA Schedule C for the multi- jurisdictional project. Federal EA requirements may also be triggered if federal lands, permits and approval, or funding are included with the project. All relevant environmental inventories and analysis undertaken for this assignment will be of sufficient scope to satisfy both Federal and Provincial EA requirements. The primary study area, shown in Figure 1, includes the linear Ottawa Road 174 corridor from the Split easterly to Trim Road. From the Trim Road crossing easterly the Study Area will allow consideration of alternative road solutions and alignments that will satisfy the Class EA as reasonable alternatives to reach the eastern Study Area limit at County Road 8, using either the existing corridor or the protected southern Rockland corridor. The study area may be adjusted as necessary in order to comprehensively identify the influences on, and the effects of the undertaking as options are developed. Project scoping is ongoing. A Request for Quotation (RFQ) and Request for Proposal (RFP) process will be undertaken with award of the EA study anticipated in spring, 2012. The EA study is expected to be completed in approximately 2 years. Transit integration plans east of the City of Ottawa. Project Cost Estimate Report identifying the project baseline budget in Work Breakdown Structure (WBS) format divided in logical divisions including the geographic limits of the City of Ottawa and County. The project estimate will be sufficiently accurate for budgetary purposes and for funding applications, as appropriate. Define public consultation opportunities with the public and business consultation groups and Public Open Houses. This study will involve a number of stakeholders, including community groups, property owners, businesses, approval agencies and special interest groups. Early in the study process, stakeholders will be identified. This will be accomplished through various forms of consultation, including liaison with Ward Councillors in both the Cities and County. This study will examine a wide range of technical, social and environmental issues and will incorporate a broad number of community and business interests. The success of this effort is contingent on an effective and timely consultation program. The consultation process will include meetings with key stakeholders as well as an Agency Consultation Group (ACG), a Public Consultation Group (PCG), and a Business Consultation Group (BCG). The membership, roles and responsibilities of these groups will be refined through the Study Design, and include a general invitation to all City of Ottawa Advisory Committees. Consultation with the general public will occur principally through Public Open Houses, but also through meetings with affected interest groups, the project web page and by e-mail. Additional meetings with specific agencies, groups or individual property owners will be held as required in order to address any particular issues as they may arise. Any accessibility requirements during the consultation process will be provided in accordance with the Accessibility for Ontarians with Disabilities Act. A Study Web Site has been established by the United Counties of Prescott and Russell: Road to Rockland.com, which will have links from the City of Ottawa, City of Clarence-Rockland and United Counties web sites. The Class EA work begins with the review of the need and justification for safety and capacity improvements to Ottawa Road 174/County Road 17 from the Split to east of Rockland. This exercise will be carried out by forecasting travel demand, and determining both existing and future needs for a facility with respect to the impact on east-west travel demand/distribution, economic benefits and links to major employment destinations. In addition, the study will conduct a collision and roadside safety analysis to identify current and projected transportation operational problems and opportunities within the study area. An inventory of the social, economic (agricultural, recreational, employment, retail etc. ), physical and natural environments within the study area will be compiled. The inventory will consider all available background material and where necessary, supplement this information through on-site surveys and/or detailed studies. The inventory must be of sufficient detail to enable the analysis and evaluation of alternative transportation solutions, designs and mitigating measures. Aesthetics – views and vistas. The existing conditions must be completed for the entire study area so that as alternative solutions and designs are developed and analyzed, the cumulative effects can be examined. It must also be broad enough to fulfill both Provincial and Federal EA requirements. The Study will identify and examine all reasonable alternatives for improvements to Ottawa Road 174/County Road 17 from the Split to east of Rockland. o Expand the existing Ottawa Road 174/County Road 17 roadway. Analyze and evaluate the alternative solutions and select the preferred solution(s). The different alternative solutions and designs will be developed with input from the Consultation Groups and will be presented to the public for comments at several Public Open Houses throughout the study. Provide supporting analysis and a business case of the societal benefits of improvements and recommendations for the staging of construction and alternative or supporting infrastructure. The study will identify and evaluate various design alternatives (alternative corridors and alignments/cross sections within those corridors) for the selected solution. Alignment and cross‑section design alternatives will be identified based on consideration of constraints within the study area, and input from the public, approval agencies and landowners, as well as City of Ottawa and County guidelines/standards/practices. All proposed designs will include any required modifications on connecting roadways (public or private). A comprehensive methodology utilizing measurable evaluation criteria will be developed to evaluate the various alternative designs. The evaluation process will be clearly described and documented and allow a defendable measurable of the differences between alternatives that include mitigation. Several levels of evaluation will be undertaken of the design alternatives to ensure local design alternatives are considered and defended before comparing alternative alignments or corridors. The evaluation methodology will be capable of sensitivity testing to consider alternative values. The effects of each alternative design on the environment will be thoroughly evaluated. Mitigation measures and associated implications (e.g. cost of mitigation etc.) are to be identified and considered in the evaluation process. The study must clearly identify the initial impacts of each alternative as well as the net post-mitigation effect using quantifiable indicators and measures wherever possible. An accurate project baseline budget will be developed to allow the County and City of Ottawa’s short and long range capital budget forecasting, priority setting, and development charges strategy or application for funding from upper tier governments. The baseline budget will be developed using a Work Breakdown Structure (WBS) format in current dollars, including parametric estimating information from the City of Ottawa and MTO for similar projects, and include contingency allowances. Project costing is a fundamental criterion in the evaluation of alternatives and will be a key consideration in the analysis of staging considerations and to establish implementation strategies. The recommended plan will clearly identify and set out the requirements and timing for all subsequent approvals required to proceed with the construction phase of the project. The recommended plan will be presented to the City of Ottawa Transportation Committee and Council, City of Clarence-Rockland Council and United Counties of Prescott and Russell Council for approval. An Environmental Study Report (ESR) will be prepared to document the entire study process including the approved design, mitigation measures, and consultation efforts. The ESR will be placed on public record for a minimum 30-day review period as per the Environmental Assessment Act. Consultation with public agencies, private groups, City of Ottawa Advisory Committees and individuals is an integral component of this Study. The consultation process will include meetings with key stakeholders through an Agency Consultation Group (ACG), a Public Consultation Group (PCG), a Business Consultation Group (BCG), and the general public through Public Open Houses. A minimum of three meetings with each Consultation Group will be held during the course of the study. Representation on the ACG, PCG, and BCG will be confirmed during the development of the Study Design and in consultation with Ward Councillors. A Public Consultation Group (PCG) will be formed to enable private groups to provide direct input to the study, advising and commenting on local issues and concerns. PCG members may include representatives from local community groups, special interest groups, and adjacent property owners. Membership of this group will be determined in consultation with affected Ward Councillors in the Cities of Ottawa and Clarence-Rockland. A Business Consultation Group (BCG) will be formed to enable business representatives to provide direct input to the study, advising and commenting on local issues and concerns. This group will reflect interests from both the City of Ottawa and City of Clarence-Rockland business areas. The Public Open Houses (POHs) will be held to present and obtain feedback on Alternative Planning Solutions, environmental inventories of existing conditions, alternative design concepts, the analysis and evaluation, Technically Preferred Alternative and the final Recommended Plan including mitigation measures. The EA assignment will include three rounds of bilingual POH meetings that include a formal presentation and question and answer period at each POH. The POHs will be advertised in daily and local newspapers and notification will be e-mailed to persons on the Project’s Master Mailing List. Background and presentation material will include a Project Update Newsletter which will summarize the information presented at the POH and will be available for general distribution. All material presented at the POH meetings as well as the Project Update Newsletter will be bilingual. Bilingual staff will be present during all Public Open House meetings. A summary report will be produced to document each POH including all comments received. A Master Mailing List will be prepared and updated via Public Open Houses, general enquiries, e-mails and other forms of consultation. A Project Information Web Page (RoadtoRockland.com) for the Study will be maintained with links from the Cities and County web sites to inform the public of the progress of the study and upcoming meetings or activities, post the bilingual materials presented at each Open House, and provide a point of contact for e-mail correspondence. To assist in providing information to the public, a Frequently Asked Questions (FAQ) document will be prepared to provide answers to common questions raised during the study. The FAQ document will be established early in the study process and will be updated regularly. It will also be posted on the web site. Aboriginal interests will be considered through direct communication with aboriginal communities and through Provincial and Federal agencies to comply with requirements of EA for consultation and accommodation with Aboriginal groups. These communities and agencies will be contacted and requested to identify any potential interest and to confirm their participation in the consultation process. The Aboriginal Consultation Plan will be cooperatively developed during the EA study with any potentially affected Aboriginal groups that wish to participate in the EA study process. The Aboriginal Consultation Plan may extend beyond what would ordinarily be required under the Provincial EA legislation as a result of consultation obligations confirmed by recent court cases.